Earlier this month, I posted about my intended gypsy lifestyle for the remainder of the month. I will be leaving Detroit today, and will not return until December 28/29, depending on flight loads. Above is a picture of (a new version of my) trusty silver suitcase. It has traveled with me for over 40,000 flight miles and 3,000 road miles with me this year. 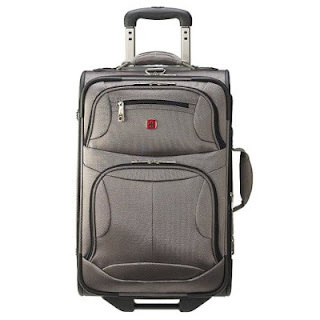 It’s a the Swissgear Zurich 20″ pilot case in metallic pewter from Target. Before I was the wife of an airline pilot, and traveled by air infrequently, I would buy the super-bargain luggage from department stores. For $69.99, you could get a 5-piece set in a myriad of colors. Perfect, right? It only took about 3 trips by air before the wheels and handle were shot. I decided that I would invest in a great carry-on bag, since checking luggage on a standby flight is a non-rev faux pas. During the summer, I’ll include my swimsuit and some capris. I’ve almost got this packing down to a science. Any other tips for packing in with limited space? Previous page Previous post: Oh, Kay!